AS ENERGY PRICES SOAR CALIFORNIANS ARE LOOKING AROUND answers. How did we get into this mess? How do we get out? On Thursday Assemblymember Virginia Strom-Martin was in Eureka as part of the Assembly Subcommittee on the Regional Impact of Electrical Deregulation. She heard a litany of horror stories from area business leaders and government officials -- fearful tales of shutdowns, layoffs, major business deals delayed, whole industries threatened. "We are indeed in the middle of a crisis," said Strom-Martin in her opening statement, "one that challenges us to deliver more than short-term solutions. We're putting the state's financial clout into the energy-buying business, but we need to look at long-term solutions as well. "Looking at ways to produce energy from alternative technologies is obviously not something that's new on the North Coast. We've been getting off the grid through solar, wind and cogeneration for years. I'm sure we can continue with those efforts and set an example." Among those in the audience was Michael Welch (in photo on left), associate editor for Home Power Magazine and head of the renewable energy advocacy organization, Redwood Alliance. Welch says when it comes to alternative energy, Humboldt County is a hotbed of activity. "There are more people living off the grid with renewable energy here than in any other region in the world," he told the Journal in a conversation at Redwood Alliance headquarters in Arcata last week. David Katz, founder of Alternative Energy Engineering in Redway, figures Welch is right, at least when it comes to the southern part of the county. "We're assuming there's about 5,000 people off the grid in Southern Humboldt," he said. "And we know there are 2,200 people in Redway and Garberville on the grid. We figure about 50 percent of those living south of Myers Flat are off the grid." "It's because we have a 40-acre suburbia surrounding Garberville," said Katz. "And it has a lot to do with marijuana." "No. 1, a lot of people came to the county in the '60s and '70s as back-to-the-landers. They were looking for a way to play their Grateful Dead music. They started buying batteries to run their tape decks and ended up with solar panels. "The other contributing factor is that these people living in the back country were growing various crops that allowed them to afford solar." Charlie Wilson is one of the back-to-the-landers who moved here in the '70s. He bought land in Whale Gulch and set up his own electric system using the power of the sun and the wind. In 1980 he was hired by Katz to help run his fledgling alternative energy business. Engineering in Redway, and Wilson's dog, Remy. "David had a VW auto repair place called Red Star Automotive," Wilson recalled. 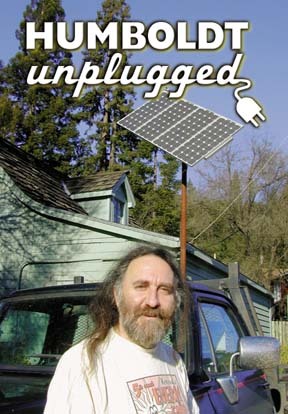 "He got into alternative energy because people were coming in wanting to have a second battery installed in their car so they could drive up to their cabin, plug in an umbilical cord and power a couple of lights and a radio or some kind of sound system, typically a 12-volt auto stereo. That led into selling 12-volt light fixtures that were made for RVs and it just kind of grew from there." Katz moved from Alameda to Southern Humboldt in 1977, leaving behind a job as an electrical engineer for the naval air facility's Electrical Warfare Department. He says he did not get into solar power because he wanted to change the world. "Now that I'm in it I realize that's [doing the right thing]," he said, "but I never really thought about it when I was getting involved in it. It was just something people around here wanted. I think I'm naturally oriented toward business. Even when I worked for the Defense Department I had a Volkswagen parts business on the side." That said, he admits that he was "sort of a lefty protester kinda guy" in the '60s and '70s. "I was definitely anti-government, anti-corporation." The logo for his business included a "power-to-the-people" raised fist holding a lightning bolt and an electric cord pulled from the wall. Many of the solar panels, wind generators and associated hardware that power Humboldt's off-the-grid homes pass through the Redway warehouse. But local sales are a minor part of the business. "Probably 80 percent or better is wholesale," said Wilson. "We ship stuff to every continent including Antarctica. That's been our bread and butter. In many ways the Third World is a bigger market for renewable energy than the First. They don't all have the money, but some do and those who do have a tremendous amount of money. And they want the amenities that the First World has." Alternative Energy Engineering has grown considerably since its humble beginnings. By 1998 it was doing $4 million a year in sales. In March 1999 the company was purchased by Idacorp, parent company of the electric company Idaho Power. AEE was the last of four companies purchased by Idacorp. The consortium took the name Applied Power. "In '99 after the buyout we, along with the three other companies, did $22 million," said Wilson, "and most of that business was shipped out of this warehouse. We would fill the UPS truck to the point where the driver was damn near standing on packages when he left the parking lot." Being part of a large corporation changed a few things: 15 new employees doubled the staff and those working full-time received raises and benefits including health and dental insurance, a 401(K) plan, paid holidays and vacations. "The down side to it was we were dealing with a large corporation," said Wilson. "I think the theory in the original buyout was to put this large corporation together, show a profit and then go public (with an IPO). Idacorp thought they would sell shares and keep a large percentage, making far more than they paid for the companies." There was a flaw in the plan. Idacorp's growth projections were based on an unusual period in the history of alternative energy. At the end of the century there was a spike in the graph caused by what Wilson calls "Y2K hysteria." and 100-watt solar panels in AEE showroom. "We did $22 million in business in 1999. Idacorp figured we would do $50 million in 2000 and $100 million in five years." "What they didn't take into account was the fact that '99 was an unusual year with a lot of business driven by media hysteria. A lot of people honestly thought the world was going to come to an end at midnight on New Year's Eve. The lights were going to go out, the water was going to stop running and anarchy was going to be at hand. It didn't happen." Idacorp's mistaken alternative energy growth dream coincided with a major drop in the NASDAQ as high tech IPO fever waned. There was also an increased demand for the cheap hydroelectric power that was Idaho Power's bread and butter. Applied Power was put on the market and a buyer was found, one from overseas. At the end of January Applied Power was purchased by the Schott Corp., the North American division of the international company, Schott Glas. The Southern Humboldt operation is now officially known as Schott Applied Power Redway. Schott Glas was founded in 1884 when glassmaker Otto Schott and optics expert Carl Zeiss joined forces to make microscopes. Today the company has over 19,000 employees worldwide and around 3,600 in the United States. Last year Schott's international sales totaled $1.8 billion, American sales were around $500 million. "Schott has been making specialized glass systems and components for more than 100 years," said Barbara Augenblick of Schott Corp. in a call from New York. "As times have changed our focus is still on special glass, but we are involved in other emerging new materials as well." Schott's space-age glass technology includes perfection of a glass formula impervious to heat and cold. The 16 North American subsidiaries make products ranging from the glass tops for modern electric ranges and the shelves for refrigerators to lenses for Ray-Ban sunglasses and huge parabolic mirrors used in telescopes like the one atop Mauna Kea in Hawaii. "Photovoltaics is designated as an area where Schott wants to become more involved," said Augenblick. "Applied Power was a market leader in certain parts of that field so that's why it was attractive to us." "Their plan is to start making solar panels," said Wilson. "Whether they'll make them in the states or Germany remains to be seen. Once they start making them, we'll be selling them and shipping them." The "we" he refers to includes other Schott Applied Power companies in less remote areas. "We're in the middle of nowhere. So it's likely the major warehousing will be somewhere else," Wilson conceded. But the Redway operation will still be a key part of the business. The sales and technical staffs have an advantage in this growing industry: They've been at it for years. "We've been told several times that the reason we were bought is because this area is where you find the expertise. Most of the people who work here live off the grid," said Wilson. "You're not going to find people who have been working with solar electricity as long as we have in an urban center. There's no reason for that technology to be there. It's the kooks in the hills who pioneered renewable energy." The Alternative Energy Engineering building in Redway is run on a standby power system known in the industry as a UPS -- "uninterruptable power system." It's a complex composite, an on-the-grid/off-the-grid hybrid called an intertie. 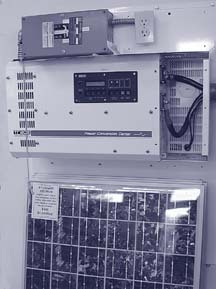 Attached to one wall of the small AEE showroom in a device called a Trace inverter. "Essentially we're using it as a battery charger," Wilson explained as we walked into another room to see the rack of batteries. "This battery bank will store about 80 kilowatt hours of electricity, enough to run the business, if we're careful, for about a week. It's connected to a 12,000-watt sine wave inverter that makes the DC power into AC power. That's what's powering all the computers, all the plug-in appliances in the building right now." And there are plenty of computers upstairs where the sales staff is hard at work and "phone techs" field "How does it work?" calls from around the world. Wilson explains, because of the battery system, "If the grid goes down the computers won't crash. You won't even know the power is out." The building is designed to use natural light. What lighting there is runs directly on DC power. The system is connected to PG&E, but there are also about 2,000 watts worth of solar panels on the roof generating power that helps feed the batteries. "When the batteries are full our extra solar power goes back to PG&E," Katz said. "We give it to them for free." Wilson said recent rolling blackouts have led to an increase in inquiries about standby systems. In general the energy crisis has spurred a new burst of interest in various forms of renewable energy. But Katz is quick to point out that switching to solar power is not a cheap and easy solution. "PG&E is a bargain," he said. "Even with the current rates, it's still a bargain. People don't realize that. They think those living off the grid just spend a few thousand to put in a system then that's it. But just the battery replacement costs add up to about 30 cents a kilowatt hour -- about twice the going rate for electricity -- and you still have to buy the other equipment." Solar systems are still not cheap in part because there is not enough demand to drive prices down. There is money in sales, but the companies making panels are not turning a profit. "There's a lot of research and development going into solar. It's still growing, but it doesn't make money. There isn't enough use," said Katz. One way to increase solar usage -- and decrease the demand on the grid -- is through tax incentives and rebates. "In Germany there are lots of tax breaks for putting solar up," said Katz, "so it's a very big business." After the hearing in Eureka, Strom-Martin faxed the Journal a list of over 100 energy bills being considered by the Legislature in its emergency session. Among them are five that would reduce the cost of renewable energy through income tax credits, loan guarantees, dropping the sales tax on solar panels or retrofitting public buildings with alternative energy technologies. There's already a state program in place offering rebates to customers of PG&E. "The California Energy Commission will give you up to $3 per watt if you offset utility power using solar or wind," said Katz. Established in 1998, the program drew little interest until the crisis hit. Now they can hardly keep up with the applications. Wilson says the increase in interest is good news and not just because it will help business. He sees his work as more than just a job it's a mission. "You see these bumper stickers on the back of RVs, `I'm spending my children's inheritance'? Well, we're doing just that. We're spending our grandchildren's inheritance. We're burning their carbon, we're polluting their atmosphere, we're screwing up the world for them. We'll be dead and it will be their problem. "I think solar and renewable energy is one way we can start paying the bill ourselves and not just roll it off with interest onto our descendents." Michael Welch has been with nonprofit Redwood Alliance since shortly after it formed in 1978 in connection with the movement to permanently shut down PG&E's Humboldt Bay Nuclear Power Plant. Since succeeding in that fight the group has actively participated in devising decommissioning plans for the plant. According to Welch, "We have finally gotten PG&E to deal with the nuclear waste and reactor in just the way we want. Soon, we will not have to worry about earthquake dangers at the plant." Since then the group has moved forward to work on alternatives to nuclear and fossil-fueled power. "We're an environmental organization that works strictly on energy issues," said Welch in a conversation at the Alliance office which ironically is located in what was once the Arcata PG&E office. "We use education and advocacy to promote the use of renewable energy. I'm a volunteer with Redwood Alliance. My for-pay job is as associate editor for Home Power Magazine." Redwood Alliance will be holding workshops starting in May to teach folks how to implement solar-made electricity in their homes. When the Journal showed up at Six Rivers Solar Co. in Eureka, manager Michael Eckhard (photo at left) was too busy unloading solar panels to talk. Half an hour later, when he had time to sit down for a few minutes, he explained that business has been brisk. "Since the insanity with PG&E we've seen three times as many people come through here," Eckhard said. The panels he unloaded were worth about $60,000 -- and were all sold before they even arrived. Founded by Norman Ehrlich in 1980, Six Rivers offers a variety of solar solutions from photovoltaic to designing and building sunrooms and skylights. The company builds solar heaters with solar roof collectors that use the sun to heat water that then drains down pipes running back and forth under house floorboards. Called radiant floor heating, the system is "the industry standard" for efficiency, Eckhard said. "We do complete systems ready to go," Eckhard said. "You can educate yourself and hope you've learned enough to design and install a solar system," he said, "or you can go to a company that has been doing it for 20 years." Unless you have professional training or superhuman intelligence, "It's almost impossible to just buy the parts" of a solar system, said Jay Peltz (photo at right), an alternative energy consultant. He should know. He has designed systems for homes for six years (including four years at Alternative Energy Engineering) before deciding in late 2000 to get into hands-on installation work. 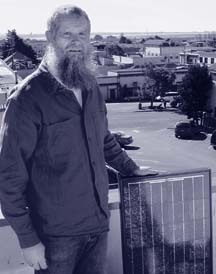 Peltz is one of several individual alternative energy advisers in Humboldt County. They provide the expertise and time required to make sure the system you buy works and is appropriate for your home. His first advice to people looking at going solar has nothing to do with photovoltaic cells. "For most people it will be way cheaper to reduce consumption than to produce energy," he said. A solar system that will produce 1,000 watts could cost around $10,000, and "you may be able to reduce your loads for a lot less." Many people get caught up in the hype about the state's rebate program, Peltz said. The program promises to pay for $3 a watt of solar energy or 50 percent of the system, whichever is less. In reality, Peltz said, it rarely pays for more than 30 percent. "It's just like a sale at the mall," Peltz said. "The ad says 30 to 50 percent" -- but all you ever get is 30. People need to realize the rebate program won't give them 50 percent so that they can make the best choices, Peltz said. "They should put solar on their roof, but they need to do both" power production and conservation, he said. 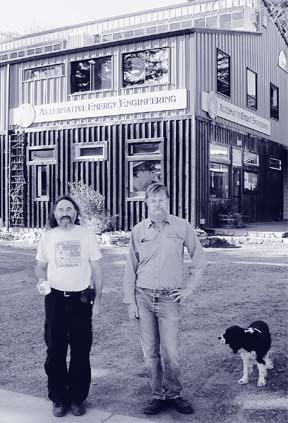 When Larry Schlussler (photo at left) was a graduate student at UC Santa Barbara in the late '70s, he got a grant to design an energy efficient refrigerator. After school he worked on incorporating solar energy into homes in Willow Creek. Then in 1984 Schlussler said he "ran out of work, moved to the coast, and needed something to do," -- so he combined his two areas of expertise. "I heard about people living in the hills in solar-powered homes. I knew they needed an energy-efficient refrigerator that was wired for solar." That wiring was very different in the early days of solar power because photovoltaic cells produce DC (direct current), like a battery, instead of AC (alternating current), like a standard home's wiring. Today you can install an inverter to convert DC to AC, but in the early days solar-powered homes required solar-specific appliances. So Schlussler started Sun Frost, which manufactures refrigerators for both solar and conventional home use -- all several times as efficient as commercial models. The company sold just one refrigerator in its first year and three in its second. Sales have gradually increased and last year Sun Frost sold about 1,000 units. Sun Frost refrigerators cost around $2,500, more than regular factory-built models. But like all energy-efficient investments, they will eventually pay for themselves in reduced energy costs. Schlussler said 80 percent of his customers are solar consumers, but they're not all back-to-the-landers living in the hills. In the last 10 years, Sun Frost has begun manufacturing refrigerators for distribution in the Third World. The refrigerators are very small, very efficient and specifically designed to store heat-sensitive medical supplies. Sun Frost vaccine refrigerators are "in over 50 developing countries," Schlussler said. Schlussler hasn't pushed the company's growth. His Arcata plant, a labyrinth of corridors and rooms filled with refrigerators in various states of construction, would make Henry Ford wince. Assorted parts and tools line the walls, workers wander back and forth between projects, and there isn't a conveyer belt in sight. It may not be the most productive system, but Schlussler has good reason for keeping his company unautomated: He doesn't like debt. Building a conventional refrigerator factory would require "investing quite a few million," he said. By keeping his production process labor-intensive, he's been able to "bootstrap" the company into success without ever borrowing a dime. Steve Murphy (photo at right) noticed something while vacationing in Mexico in 1976 that changed his life. "I was staying in a little cabin in the mountains and it had this wood-fired water heater." It heated enough water for a short shower in about 15 minutes burning only scrap wood or trash. He was so impressed that he sought out the heater's inventor, Señor Jesus Bravo, in Mexico City. Murphy sold the heaters in the United States until 1984, when Bravo died. 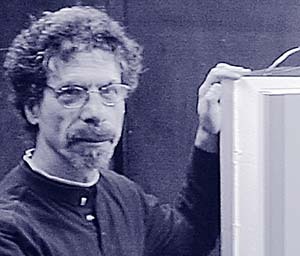 He dropped the idea until 1995, then redesigned the heater and entered the U.S. market. He's been building them in Eureka for five years. But those days are done, he said. Like other manufacturers before him, he has found the cost of making and shipping his product on the North Coast to be prohibitive and is moving south to Mexico. He said it cost $400 to make a water heater in his plant on Broadway in Eureka; it will cost $150 in Mexico. "At the prices we have to charge now, hardly anyone can afford them," Murphy said. "The cost of manufacturing here makes it impossible." As you might guess most Humboldt Unplugged businesses are on the Web. 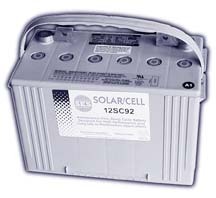 Alternative Energy Engineering's online catalogue is at www.solarelectric.com, Redwood Alliance is at www.igc.org/redwood. The links page there will take you to more information including www.homepower.com. Then there's www.sixriverssolar.com, www.sunfrost.com and www.hotpro.com. Details on the state's Emerging Renewables Buy-Down Program are at www.energy.ca.gov/greengrid.